Pretty Necklaces Made From Leftover Cereal Box. Can You Believe It? This paper necklace is easy enough for older children to make, but adults will love it too. No one will believe this necklace is made out of a cereal box and computer paper! This is a great craft for teachers and homeschool Moms to make in art class! Using the large paper punch, cut 4 circles from leftover cereal box or cardstock. Make a mark with a pencil or pen on the center top of one of the cardboard circles approximately .25 inch from edge. Punch a hole on the pencil mark with the small paper punch tool. Stack a paper circle onto the circle with the punched hole. Use the punched cardboard circle as a template to punch a hole in the other circle. Continue until all four circles have a hole punched in the exact same location. Let the cardboard circles dry. 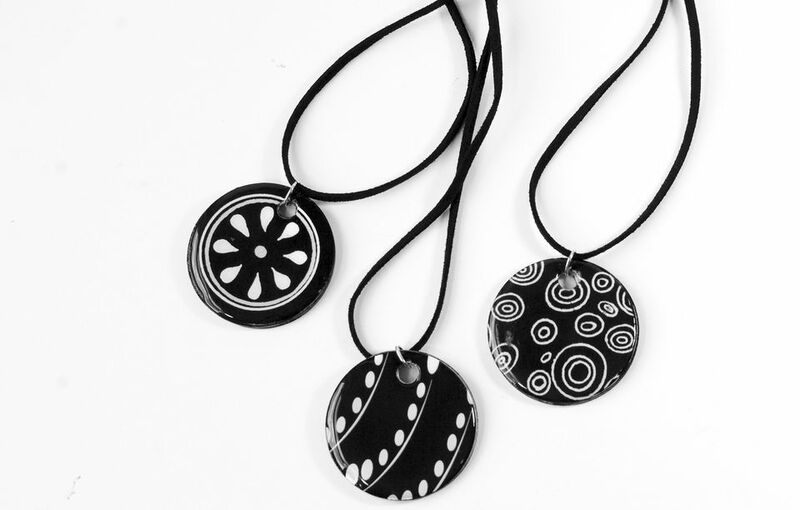 Print the necklace pendant template on a laser printer.. Using the 1 3/4 inch punch, cut two circles. One circle should have a design, and the second circle should be black. Place the circle with the design onto the top of the cardboard stack, and punch a hole with the small hole punch tool,using the cardboard stack as a guide. Glue the circle with the design onto the top of the cardboard stack. Place the black circle onto the bottom of the cardboard stack, and punch a hole with the small hole punch, using the cardboard stack as a guide.. Glue the black circle with the glue stick onto the bottom of the cardboard stack. Pour approximately 1/2 inch of PC-Wood Petrifier into a plastic container.The PC-Wood Petrifier will make the cardboard discs, paper front and back circles very stiff and shiny.This stuff is magical! Form a hook with floral wire, and attach the cardboard disc. Dip the disc into the PC-Wood Petrifier and hang to let the disc dry. After about 10 minutes, dip the disc once again. The disc should be dipped approximately 5 times. The disc will be dry to touch in about one hour. It will be smooth, shiny and hard after about 24 hours. Spray the disc with acrylic sealer and let dry. After the disc is completely dry, apply Dimensional Magic to the front of the disc. Make sure that you are careful when applying the Dimensional Magic formula, not letting any drip over the side. Dimensional Magic will add a very shiny and rounded top to the disc. Allow the disc to dry overnight. When the paper disc is completely dry, add a jump ring through hole at the top of the paper disc using a loop closing plier. Run a leather or silver chain through the jump ring. Your necklace is now finished and ready to wear. Who would have thought that this lovely necklace would have had it start from a lowly cereal box? Awesome!